Robie Mortin is 92, and what she calls “this whole thing,” historians call the Rosewood Massacre. On that day 85 years ago, a 22-year-old white woman named Fannie Taylor told the Levy County sheriff that a Black man had assaulted her. Soon a mob of between 400 and 500 people was searching the woods around Rosewood, a community of about 30 Black families east of Cedar Key. Suspicion had fallen on Jesse Hunter, a Black man who recently had escaped from a chain gang. He was never found, but after seven days of violence, six Blacks and two Whites had been killed. The homes, stores and churches of Rosewood lay in ashes, and the surviving residents had fled through the woods. Ms. Mortin’s uncle, Sam Carter, was the first to die. Rosewood is little more than a historical marker at the side of State Road 24 now, but Robie Mortin is still very much here. Her mind is sharp, and she’s not afraid to speak it. Even though she spent 13 years in Okeechobee after her late husband’s retirement and now lives in a West Palm Beach apartment building, she still considers herself a lifelong resident of Riviera Beach and still owns a home there. She would be worth a visit, even if she hadn’t arrived in 1925 as a Rosewood refugee. “My daddy got up that Tuesday morning, and he went to work, and this is when he learned all about this,” she says. “He didn’t say anything about Uncle Sammy out there hanging in the tree,” she says. Ms. Mortin’s grandmother went back to Rosewood long enough to see the destruction and conclude it was no place to live anymore. She traveled with her grandmother, her two older sisters, and a brother-in-law, living on rabbit and squirrel, sleeping beneath a tarpaulin by the side of the road until they reached the little town of Eau Gallie, just north of Melbourne, where her brother-in-law found work on the railroad. Eventually, they found their way to Kelsey City, a new development that now is Lake Park. But Ms. Mortin still calls it Kelsey City. They settled just south of town and soon found that others from Rosewood had done the same. Her grandmother bought three lots for $25 each, and they settled, and stayed. And Riviera Beach became a city. In time, she found domestic work in Palm Beach and learned about rich people. She was married twice, raised four successful children, buried one and lived to see the state grant $2.1 million in reparations to the Rosewood survivors. She got $150,000 of it, but it hasn’t changed her style. And she still knows what happened that New Year’s Day all those years ago. The truth, Ms. Mortin says, is that Fannie Taylor was beaten by a White railroad man with whom she’d been carrying on for a while. He would jump off the train on its way to Cedar Key, visit with Ms. Taylor while her husband was at work, then jump back on when the train came back east. 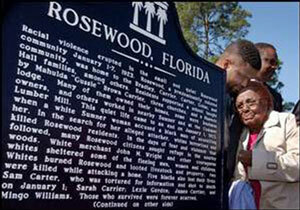 The official report found several other former Rosewood residents or their descendants who say the same. On Oct. 5, the city of Riviera Beach rededicated one of its few institutions older than Robie Mortin: the newly renovated Sugarhill Cemetery on 30th Street, where the earliest bodies were buried sometime before 1920.